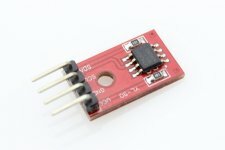 If you need to do some data storage in Arduino but found that the EEPROM in ATmega chip too limited, then this I2C EEPROM module is your best choice. This module is based on the EEPROM chip AT24C256, which has 256k bit capacity. It communicate with Arduino with I2C bus, helps you do much more data storage easily.